It was also noted that the level of spare capacity might be lower than many currently judged. In particular, the financial crisis might have impaired potential supply by more than had been expected. Furthermore, the effect of a given level of spare capacity on inflation might have changed. As I have said - there isn't that much spare capacities in the economy as many companies have gone bust and banks aren't lending to build new capacities. QE might have depressed gilt yields by around 100 basis points. So, does BoE artificially surpressed interest rate ? There was some evidence that those who had sold gilts to the Bank of England may have been buying banks’ equities and long-term debt with the proceeds. This would have reduced deposits, but would have been beneficial for the economy as it would have increased banks’ capital and so lessened the pressure on banks to shed assets. While this is being viewed as positive by the BoE/CEPR members, this simply prolong the adjustment and benefit the bank and bankers at everyone else expenses. Are you seriously suggesting that nobody will expand their business, or start a new one, no matter how profitable it would be? Not everyone funds a start-up from bank loans, you know. He didn't say that to be fair. Of course not. It simply means that far less new business / new capacities (shops, factories) can be built, especially by weakers players (eg. those Private Equity debt to the eye ball lots). An example - there are 10 shops on the streets, 4 closes down. Local income down by 10%. Now 90% of the money are chasing after just 60% of the original capacities. So, the survivors can raise prices (and they have indeed). However, it is also worth noting that profit = (prices - cost) x volume. So firms could not increase the volume (or face decreasing volume), so increase the prices. he OP's never read Sceppy's epic posts about corporate net cash balances. Do you go into a shop to buy an unemployed? Unemployment per ser, and for the matter, empty factories per ser, aren't spare capacities. An unemployed who can't read or write aren't really a 'spare capacity' either. Also, unemployment provides spare labour capacities but they are not necessarily in the right areas. There are of course lots of building labour capacities, but they aren't needed right now. We need banking capacities - but there isn't much left ( and hence super profit). We need retail capacities, but there are less shops. We need more telecom capacities, but more aren't coming forward (and hence BT merrily raising prices and get away with it). Corporate net cash balances are high, they just hoard on it. I do read Sceptic post and agree with him that broad money aren't growing fast. But that does not mean you can't have inflation (and we are in a period of inflation - this is a fact) and yours and my bills are now higher than it was last year. OR pro growth - favouring the reckless (in the short term anyway) and cause destructions of capital in the medium term. 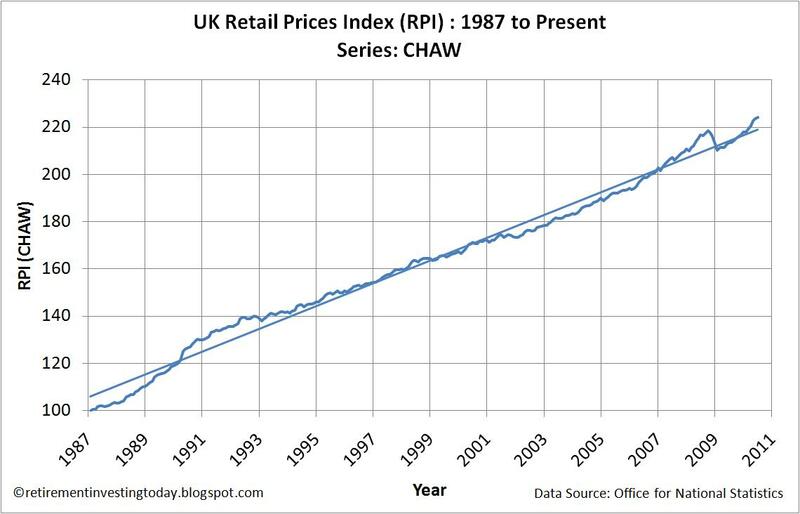 When we get a 6 months in a row of -ve RPI then I will believe we are in a period of deflation. Now what we have is 16 straight months of high RPI change (we had 3 months of -ve RPI at end of 08 when Lehman collapsed). It doesn't take long to reopen a shop. It doesn't take long to write a business case that gets capital to open a shop when prices are rising and there is a shortage of supply. That is correct - in the free market, rising prices normally brings about new capacities and attracts new capital and lead to reduce prices. However, British market is now dominate by the big boys with complex supply chains and it is not that easy to just 'open' a shop. And to compete with the big boys (e.g. to act as Woolworth replacement), one needs a lot of capital. To open another bank to compete with the big 4 is a formidable challenge which even Virgin seemed to be thinking twice. In year 2000, if one wants to setup a new telephone network, one can raise billions to do it. Not today I am afraid. Of course, there is always opportunity and those who spot them will do well. the OP's never read Sceppy's epic posts about corporate net cash balances. You could have twenty million unemployed but if they have zero skills then they aren't spare capacity. You seems to be confusing production and consumption. We have an enourmous excess capacity in consumption - shops but we have no excess capacity in production as we sent it to China. There is no potential growth to be had from consumption can't believe this argument still exists I thought it was only the lunatics at the BOe who still believed in this. I'm pretty sure we all agreed on bi-flation. Costs up, assets and wages down. It's also known as poverty. I always am looking long term and position myself for that. The chart above is why I am backing inflation. It is always the easy way out for policy makers. We dont need a Woolies Replacement. their customers have gone to the remainder. Woolies was a weak competitor and was culled by the dead hand of the market. We probably don't need Northern Rock replacement either, but the result is much higher mortgage margin. market, when the weaks are gone, they are there to sell the insurance at the price they like.